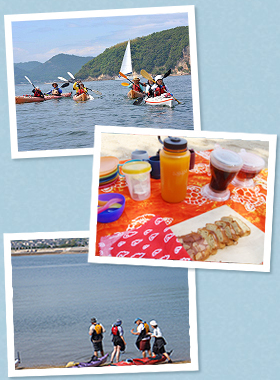 This afternoon kayaking cruise is rather more suitable for visitors with limited time, however it shows the highlights of Setouchi’s kayaking experience such as paddling along unique granite coastline and relaxing time at an island. We use stable double kayaks. Includes:Includes: a quality sea kayak, lifejacket, paddle, spray skirt, dry bags for cameras, guide and tax. If you are a small group(2-4 people), ask us about free pick-up from JR Takuma station, the closest railway station, as well as trip booking. Kayak from our base. Tea break on Tsutajima island.